Al Lamb’s Dallas Honda -- It was a beautiful racing night for Team Honda on Saturday at O.Co Coliseum Oakland. Celebrations abounded off track after Trey Canard’s magnificent rallying performance following his rather disappointing race last week. The Oklahoma born dynamo crossed the checkered flag grabbing his first victory of 450SX in almost four years. It was a thrilling night on all accounts as Trey Canard on unstoppable mode topped timed qualifying practice to conclude victory at the 450SX main event in grand style. Positive vibes extended to the rest of Team Honda with teammate Cole Seely too advancing from a sixth place last week to a season best fifth position. Eli Tomac from GEICO Honda fared even better crossing the checkered flag nano-seconds before Seely to grab fourth place in the race. Tomac recovered beautifully after an edgy start to the race. All in all it was an exciting race for the three Factory CRF 450R racers all of whom secured places within the top five. 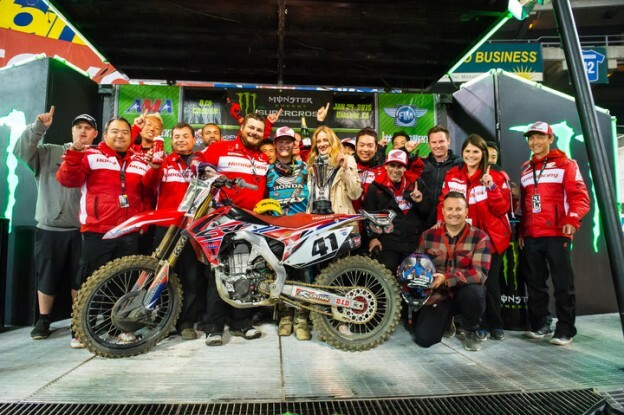 Adding further buzz to victory spirits GEICO Honda racer Malcolm Stewart was placed first in the 250SX class. · Thursday before race night Trey Canard appeared in-studio on the Sports Talk Live telecast by Comcast SportsNet San Francisco. It was a four minute live aired feature showcasing the dynamic Factory Honda CRF450R ridden by Canard. The report Jim Kozimor concluded the vibrant interview with a punchy ‘Go Honda Racing, go Trey Canard & go 41’. · The qualifying practices saw four riders clicking off laps in 51 second range. Canard scored the best with a classy 51.3587. Seely was placed at the eight place with 52.650 while Eli Tomac from GEICO Honda won fourth place with a timing of 51.944. · Seely had a dodgy start on heat one going off line but rallied about by gaining ground and passing the rider in front to finish fifth. He had to advance through second semi race where he had leads in most laps and a concluding win. · Canard meanwhile with his win at the main event went on to capitalize on Ken Roczen, the overall point leader. After victory Canard climbed the point ladder to third place from a fifth standing. At 68 total points now he is only 10 behind Ken Roczen. Roczen lost a notch slipping to second position 14 points behind Ryan Dungey the new score leader. · Seely is on a steady climb moving from 11th place to seventh in the overall championship points with a total count of 45. · In the main event Seely consolidated his performance when he moved from fifth place to second on lap five. His glory as runner-up was but temporary as Canard was in turbo-mode throughout the night crossing his teammate in the seventh lap. A slight mistake also put Seely behind though he quickly rebounded to pass the flag on fifth place. On lap seven Canard overtook Chad Reed who was in the lead and continued to dominate the rest of 20 lap race. · Fastest man on track that night was without a doubt Canard with an excellent timing of 52.106 seconds. Seely also shared the 52 second range scoring a timing of 52.742. · Canard’s last similar winning was in 2011 April when he cruised through the track on a CRF 450R at Arlington Texas. The interim period saw him tumbling through a series of injuries and partial season participation which impeded his stake at championship. After winning, Canard said that with everything that took place over the years he felt so blessed and grateful to have a chance at being back on top of podium. ‘I really feel that I have been put on earth to ride dirt bikes. So I am going to give it my 100% effort in achieving my goals’ he further said. · After the main event Team Honda is now back in Southern California where they are expected to race on January 31st for the third and final stop of the season at Angel Stadium. Anticipation moves-up with both Canard and Seely vying for higher positions in 450SX. · The day before race Red Riders are expected to appear for a autograph signing session at Malcolm Smith Motorsports. After successive interviews and a heady pre-race press day Thursday Team Honda riders had the rare opportunity of enjoying some hard-earned recreational time. They were seen in the Bay Area where Cole Seely and his trainer Brian Lopes took Santa Cruz on their stride on mountain bikes along with other crew members, riders and journalists. Team Honda members and crew explored famous Pier 39 and the Fisherman’s Wharf as well as taking an exhilarating boat tour of the bay which covered Alcatraz Island, Golden Gate Bridge and other interesting places of historical interest.